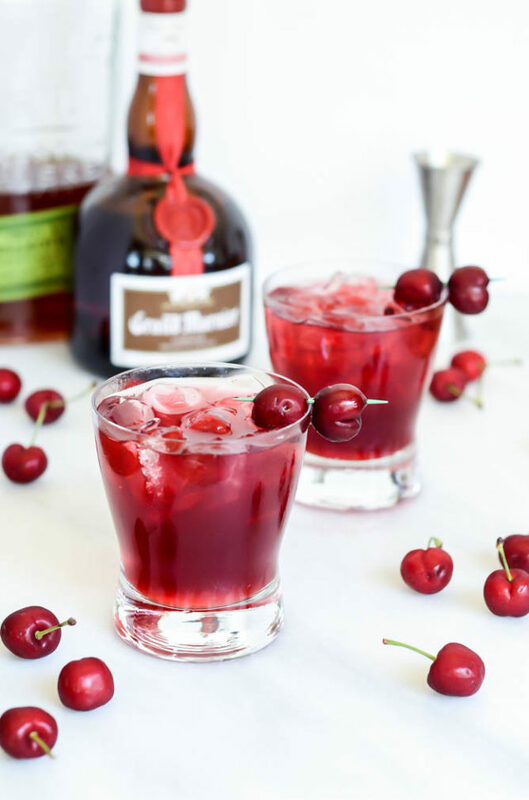 This Cherry Bourbon Breeze and its booze-free version, which I’m simply dubbing the “Cherry Breeze,” is the perfect way to kick off this little series, just in time for Memorial Day! I hope you like cherries, because both today and Monday’s posts are inspired by my inability to visit the local Farmer’s Market without loading up on the in-season “it” produce. In fact, it was a little hard for me to keep my hands off of the cherries long enough to make this. 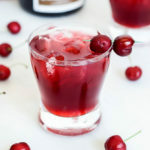 Luckily, I was able to find cherry juice at Trader Joe’s, so I could use that for the bulk of this cocktail/mocktail and save more cherries for those mid-afternoon pregnancy cravings. But before I get to this Cherry Bourbon Breeze, can we just talk about what everyone’s plans are for the long holiday weekend? The hubs and I drove up to his parents’ place in Morgan Hill last night, and are taking off early this morning for Tahoe. So excited! As I mentioned in Monday’s Cheesy BBQ Garlic Bread post, Chris’ birthday actually falls on Memorial Day this year, and since we were too busy planning a wedding last year to throw together a big bash for his 30th, we’re doing a “make-up” 30th of sorts for his 31st! There will be a total of eight of us there (plus two babies, my how times have changed!) and we’re really looking forward to a little R&R and time out in the sun. The weather is supposed to be in the 70’s while we’re there, so we’re stoked! What are you all up to this weekend?? Something fun I hope! So, about this Cherry Bourbon Breeze. It’s no secret on this here blog that I’m a big fan of bourbon/whiskey, and I probably have Chris’ love for it to thank for that. I love me a classic old-fashioned, but have also found some fun ways to mix it up like this Twisted Whiskey Kind of Afternoon and this Bourbon, ‘Barb and Blue. 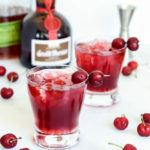 Any of which would be absolutely perfect cocktails to whip up this weekend if you’re not feeling the cherries! 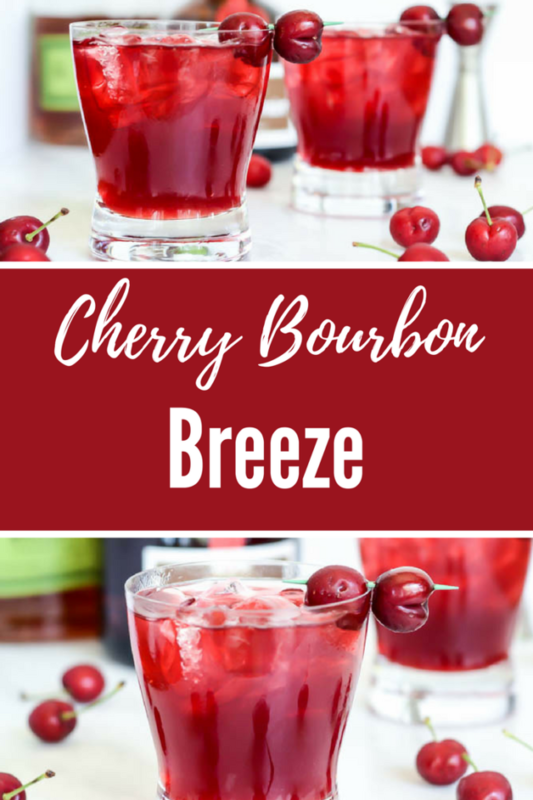 But really, you should be feeling the cherries, because they are soooo good and their flavor translates perfectly into this Cherry Bourbon Breeze. I went for the classic pairing of cherry and orange for this drink, because I knew the flavors would be spot on even in a non-alcoholic version. Did you also know that cherry juice has been proven to be an aid in recovery for sore muscles? So really, I’m doing you a favor with this cocktail here. For the alcoholic version, all you’re going to need is bourbon, Grand Marnier, cherry juice, fresh oranges and a dash of club soda. For cocktails, unless I’m making something like my fave Harvey Wallbanger Mimosa, I prefer to use juice from fresh oranges as opposed to the pre-squeezed, store-bought stuff. I feel like they add just the perfect amount of orange flavor, without completely overwhelming a drink or making it too sweet. The only change for the non-alcoholic Cherry Breeze is to simply omit the bourbon and Grand Marnier. I gotta say, it still tastes absolutely fantastic! It was only after I had already made (and consumed) the mocktail that I realized a dash of orgeat might have been the perfect little touch, so if you have some in your bar and want to give it a shot, let me know how it is! As far as the technique for making this cocktail, it couldn’t be easier! Just throw all ingredients into a rocks glass full of ice and give it a little stir. 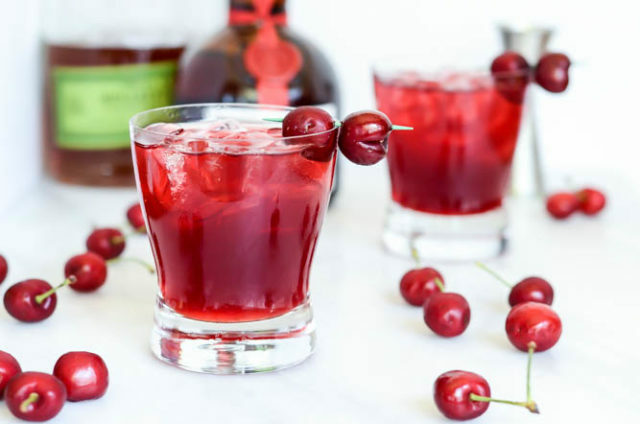 If you’re feeling daring (or just want your Cherry Bourbon Breeze or Cherry Breeze to look a little more festive) add some skewered fresh cherries as a garnish. What else do you need to kick off a fabulous Memorial Day weekend? 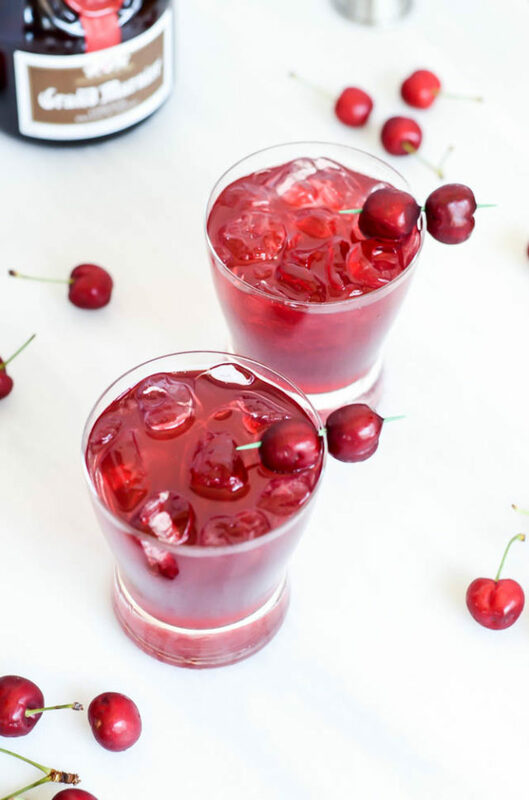 A fun, refreshing cocktail using some of the best in-season produce - cherries! Perfect for any warm weather cookout or get-together. Add all ingredients to a rocks glass filled with ice. Stir gently. Garnish with a couple of speared fresh cherries, if desired. 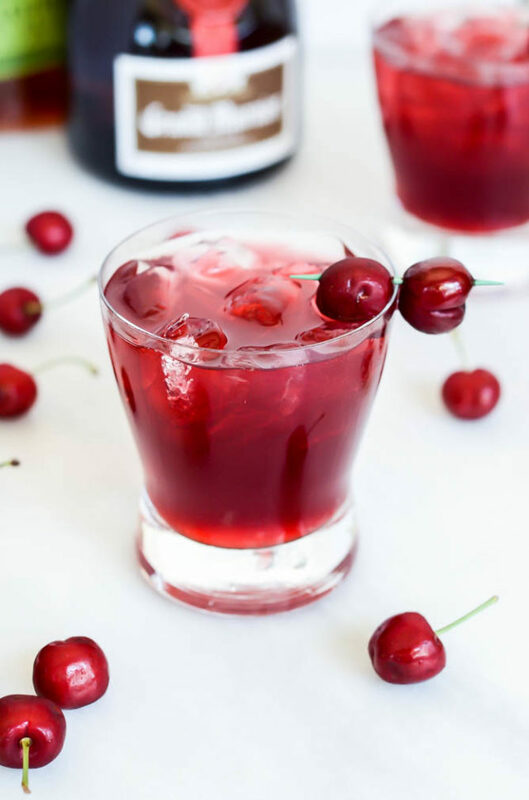 A fun mocktail using some of the best in-season produce - cherries! Flavors of orange round out this drink that's perfect for your next get-together.